Junior Springbok coach Dawie Theron praised his team’s fighting spirit as they came back from trailing at half-time to comprehensively beat Japan by 59-19 in their opening match of the World Rugby Under-20 Championship in Manchester, England, on Tuesday. It was a morale-boosting victory for the South African Under-20s, who found themselves 19-7 down after 31 minutes in the first half, but never backed off to finally outscore Japan by eight tries to three. The score at the break was 19-14. “The first half was a bit of a shock for the guys and I think they didn’t really expect that, but I told this that this is a World Cup, you have to convert your opportunities into points,” said Theron. “We probably were a little shell-shocked when they scored those three tries, but I am proud of the way the players fought back. Japan played well and they targeted the rucks, which they did not do last year. “It was a tough lesson for us, but we adapted quickly. I think we regrouped very well as a team after a hard team talk at half-time and we stuck to our structures, which worked in the end.”Powerful flank and Man of the Match Zain Davids (flank) and SA U20 captain Jeremy Ward (centre) both scored a brace of tries each, while fullback Curwin Bosch was flawless with the boot as he slotted all eight conversions and a long-range penalty goal for a personal tally of 19 points. Such was the quality of the team’s second half performance, they denied Japan from adding to their score. A series of handling errors and turnovers in the opening exchanges denied the Junior Springboks from taking advantage of their territorial advantage. However, they made a breakthrough in the ninth minute when Davids forced his way through a gap in the midfield and dashed to the tryline for the first points of the match. Bosch converted to hand the team a 7-0 lead. Japan hit back with a try by wing Ataata Moeakiola who raced to the tryline after breaking through the defence, which they converted to level the scores. A few minutes later, following a great cross kick following a series of pick-and-goes, saw Moeakiola score his second try to see the Japanese take a 14-7 lead. 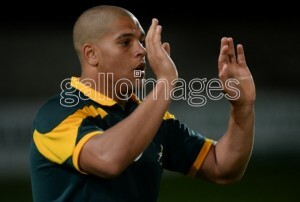 The Junior Boks were dealt a big blow soon after as wing S’busiso Nkosi received a yellow card for a dangerous tackle. Japan took full advantage of this, with Moeakiola earning his hat-trick in the 30th minute after dancing his way through the defence out wide to see his team take a 19-7 lead. South Africa replied by applying pressure on attack, and there were soon equal numbers as Japanese flank Faulua Makisi received a yellow card. Junior Springbok centre JT Jackson had the last say in the half as he snapped up a chip kick from flyhalf Manie Libbok in the 36thminute to touch down for the team’s second try, which reduced the deficit to 19-14 shortly before the break. The South Africans came out firing in the second half and applied pressure on Japan immediately, which allowed Ward to score their third try compliments of a fantastic break by Davids and a well-timed pass by Libbok. Bosch converted to hand the team a 21-19 lead. Davids’ hard work paid off again in the 44th minute after a dummy pass and straightened, which saw him cruise to the tryline for his second try of the match. Ward added his second try four minutes later after Libbok intercepted and ran up-field before passing out wide to take advantage of the space. Bosch converted for a 35-19 lead and then added along-range penalty from 51m out in the 55th minute to stretch the team’s lead. Ward and his team continued to inflict damage as the match progressed, with Libbok sneaking through a hole in the defence in the 63rd minute to touch down for the team’s sixth try, while speedster Mosolwa Mafuma added another in the 70th minute to take their score to 52 points. Japan showed their fighting spirit as the clock continued to wind down, but their efforts to score were negated by the determined Junior Springbok defence. In stark contrast to their Japanese counterparts, the South African’s continued to use their try-scoring chances as they completed the match with a try by replacement prop Carlü Sadie, which Bosch converted to secure a morale-boosting 59-19 victory. Junior Springboks 59 (14) – Tries: Zain Davids (2), JT Jackson, Jeremy Ward (2), Manie Libbok, Mosolwa Mafuma, Carlü Sadie. Conversions: Curwin Bosch (8). Penalty goal: Bosch. Japan 19 (19) – Tries: Ataata Moeakiola (3). Conversions: Taisetsu Kanai (2).